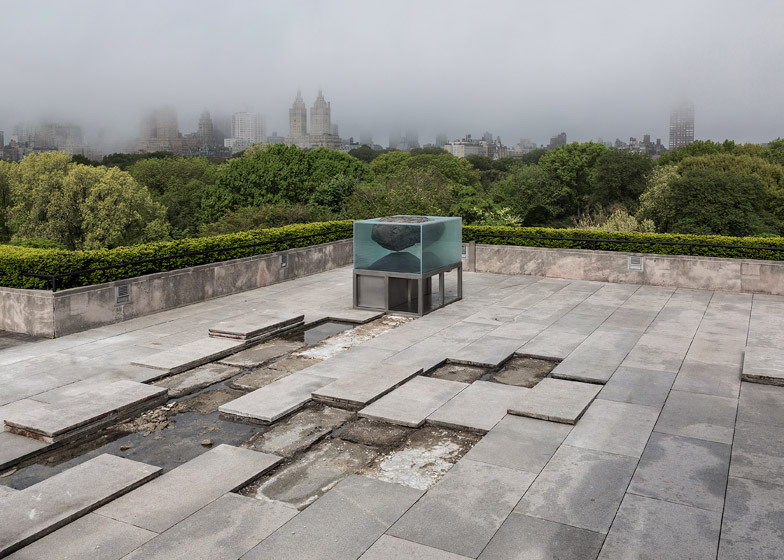 New York 2015: patches of dirt and an aquarium with ancient species are part of a new installation by French artist Pierre Huyghe for the roof garden at New York's Metropolitan Museum of Art (+ slideshow). 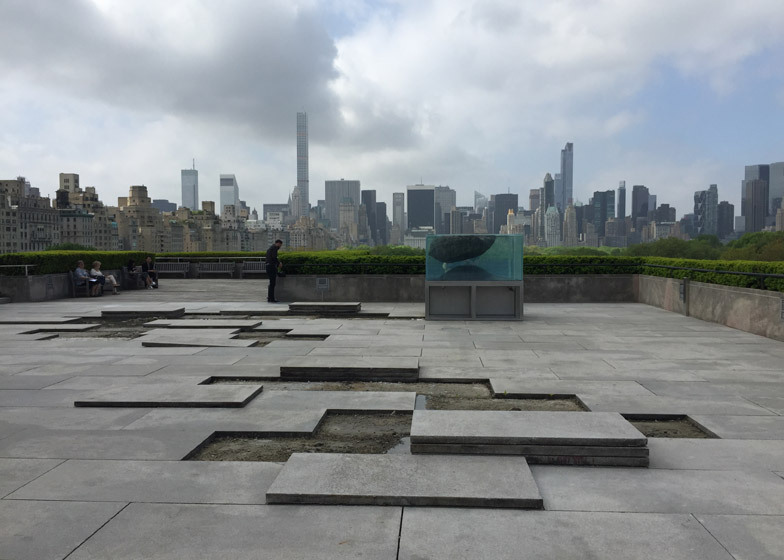 Unveiled today, the installation is part of a yearly program in which artists are commissioned to create site-specific work for the museum's popular Iris and B Gerald Cantor Roof Garden, which overlooks Central Park and offers sweeping views of Manhattan. Past artists have included Dan Graham, Jeff Koons, and Doug and Mike Starn. While artists typically focus on form and spectacle, Huyghe – who is known for conceptual installations that often incorporate natural elements – took a markedly different approach. "I was more interested in having people look down and focus on the details," he told Dezeen. To accomplish this, the artist created an installation that calls to mind a geological dig. 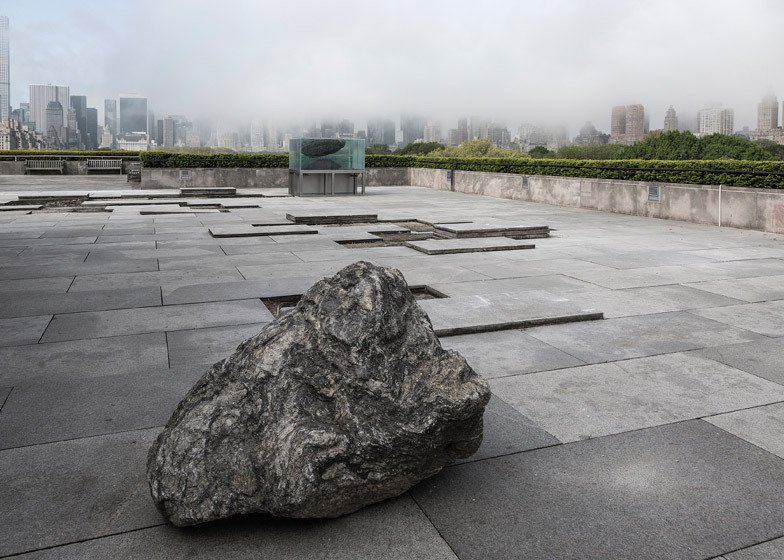 Huyghe removed approximately 20 granite pavers from the rooftop, revealing swaths of dirt speckled with debris. A large aquarium releases a trickle of water that gradually passes through the dirt patches, in some areas collecting and forming murky puddles. 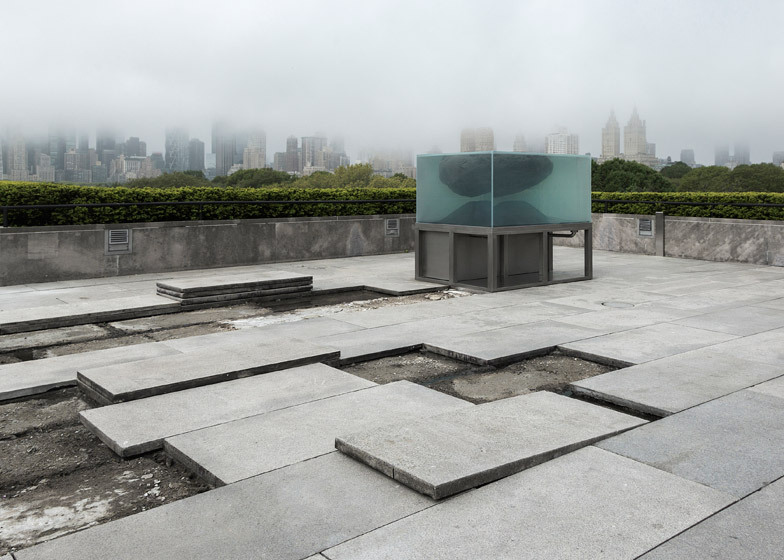 "The water will eventually make its way back into the sewer system of the museum," said Huyghe. "There is a ritual going on." The aquarium contains large, rounded rocks and several ancient living worms and tadpole shrimp. "They are the oldest species alive," said Huyghe of the creatures, noting that their form and behaviour haven't changed for millions of years. He sees the aquarium as a "preserving machine," he told Dezeen. While the installation mostly features local materials, Huyghe integrated several Palaeolithic rocks — human's first tools — from Europe or Africa, he said. 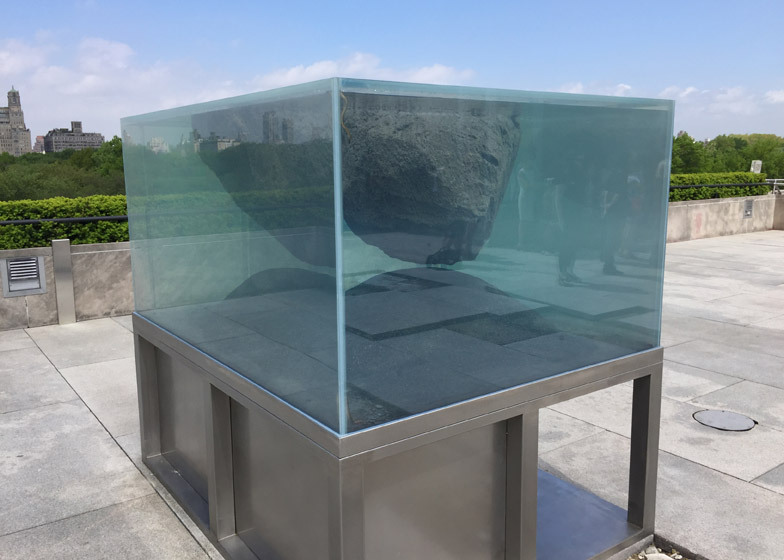 The composition also features a large limestone boulder found in New York. According to the Met, the installation draws references from various objects in the museum's collection, including ancient Egyptian sculptures and a mummy dating to the sixth century. Ian Alteveer, the Met's associate curator of modern and contemporary art, said the museum offered little guidance regarding the installation's design. "It really is Pierre who has formed this project," Alteveer told Dezeen. "It began for him as an examination of the place — the museum itself and what surrounds it. It was less about bringing things here and more about uncovering what's already here." 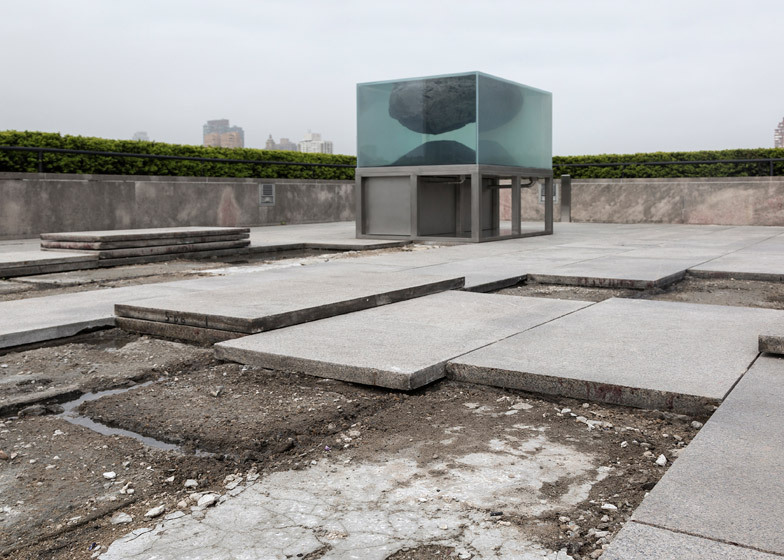 The Roof Garden Commission: Pierre Huyghe is open to the public from 12 May to 1 November 2015. In addition, the museum is presenting Untitled (Human Mask), a 19-minute film by Huyghe that depicts a creature's survival following natural and man-made disasters. The film is on view inside the museum through 9 August 2015.